Heat oven to 375°F. Grease 1 1/2-quart casserole with shortening or spray with cooking spray. In 2-quart saucepan, melt butter over medium heat. Cook onion in butter about 2 minutes, stirring occasionally, until tender. Stir in flour, salt and pepper. Cook, stirring constantly, until bubbly; remove from heat. Stir in milk. Heat to boiling, stirring constantly. Boil and stir 1 minute; remove from heat. Stir in 1 1/2 cups of the cheese until melted. Spread potatoes in casserole. Pour cheese sauce over potatoes. Bake uncovered 1 hour. 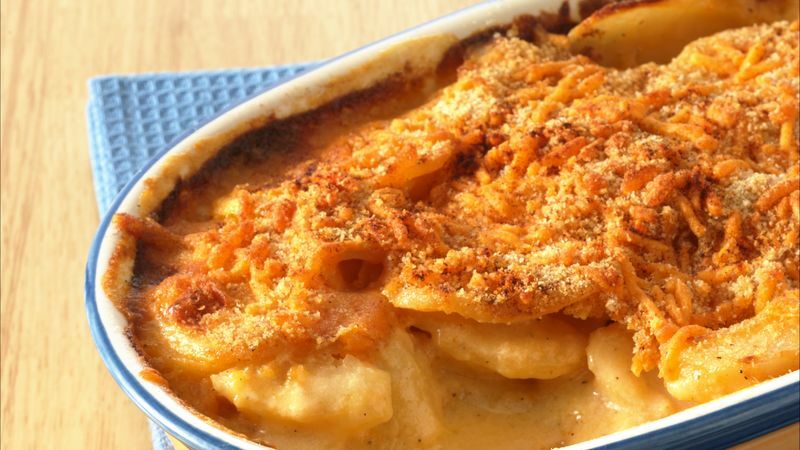 In small bowl, mix remaining 1/2 cup cheese and the bread crumbs; sprinkle over potatoes. Sprinkle with paprika. Bake uncovered 15 to 20 minutes or until top is brown and bubbly and potatoes are tender.